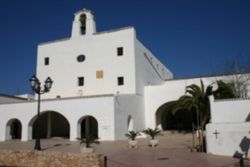 San José, the largest of Ibiza’s 5 municipalities, offers plenty of diversity and is an ideal destination for a day trip for those staying in and around Ibiza or San Antonio. Inland, the surroundings vary from the towering forested hills that host small picturesque villages to the flats of the dazzling salt pans in the far south. On the west coast, dramatic cliffs rise out of the sea, sheltering an array of largely quiet sandy beaches and rocky inlets from the winds. By stark contrast, the southern peninsula of Ses Salines gently falls to the sea, with stretches of fine, pale sands reaching out towards nearby Formentera. The development of large holiday resorts and hotels has been restricted in San Jose due to its rock-strewn landscape, which means that large parts of the region boast natural unscathed beauty and tranquillity that are hard to come by elsewhere on the island. There are a scattering of small resorts along the west coast made up of small hotels, apartments and pleasant restaurants, but exploring the rest of the area is well worthwhile where the beaches are quieter and the eateries more inspiring. Outside of the resorts there is plenty on offer for the sun-worshippers in particular the fashionable beaches at Ses Salines and Es Cavallet, beyond the salt pans on the southern tip of the isle. A number of stylish bars and restaurants can be found in this area, but do be aware that these beaches have designated nudist sections. Cala d’Hort is another stunning location, especially in the evening when the striking Es Vedrà can be seen amidst the glistening waters, silhouetted against the setting sun, even more enjoyable from the water itself aboard a luxury yacht. For the more active, the climb to the top of Sa Talaissa, the highest point on Ibiza, presents you with spectacular views over the San José coastline and more.